Venus Williams (1): This is a quick turnaround for Venus following her triumphant Wimbledon where she reached the semi-finals in singles and paired up with sister, Serena to win the women’s doubles. It’s a surprise to see Venus competing in both Stanford and Montreal following such a heavy Wimbledon. I would fully expect Venus to honour her commitment to Stanford where she’s the big name draw and will open her campaign on Wednesday campaign. Venus’s first match of the tournament will be against Kristyna Pliskova or Magda Linette. Johanna Konta (3): It’s exactly a year since Konta went on an absolute tear during the second half of 2015, winning back-to-back ITF titles and finishing the year with a 24-4 W-L record. Not only can she now make the main draws of WTA Premier events but she’s the number three seed! Konta had a decent grass court season but couldn’t navigate her way through a Wimbledon draw of land mines. Defeating Monica Puig in the first round was an excellent result, her first ever win at Wimbledon, but she went down in three sets to Eugenie Bouchard in the next round. Konta’s last outing on hard courts was in Miami where she performed admirably, reaching the quarters. It may be too early to be finding her very best form but with a reasonable break after Wimbledon and in a rather depleted draw, she should be a title contender. Konta plays Naomi Osaka or Julia Boserup in the second round. CoCo Vandeweghe (4): Vandeweghe departed a miserable clay court season which saw her miss out on a singles place at the Olympics and went flying into the grass court season; the American player won a total of 11 matches on grass and more than doubled her number of victories in 2016… this shows how much surface counts! Vandeweghe’s form on hard courts has been so-so this year but she should be able to draw on confidence from her performances on grass, which included winning a second WTA title in Rosmalen. Vandeweghe is also a former finalist in Stanford from 2012 where she defeated the likes of Jelena Jankovic and Yanina Wickmayer en route to a final showdown with Serena Williams. Misaki Doi (5): After reaching the second week of a Slam for the first time in her career, Doi is at a new career high ranking of 36. It’s been a mixed bag of results in 2016 for the Japanese player; the highs have included a title in San Antonio ($125k), finals in Kaohsiung, quarter-finals in Rome, fourth round in Wimbledon and third round in Eastbourne. These decent results have been interspersed with 11 (!) first round losses. There has been very little middle ground for Doi and when she’s won a match at a tournament, more often than not, she’s backed it up with multiple victories. First up in Stanford for Doi is Xinyun Han who she defeated in the second round of San Antonio earlier this year, 7-6(5) 7-6(4). Jelena Ostapenko (6): Much like Doi, it’s been a season of highs and lows for Ostapenko; she made a name for herself in Auckland in *that* match against Naomi Broady, but let her tennis take centre stage in Doha where she rolled through the draw to reach a first Premier final. Ostapenko has secured seven top 50 wins in 2016 but hasn’t yet mastered consistency at this early stage of her career and is 0-3 in Slam main draws this year. She will play Catherine Bellis in the first round of Stanford. Varvara Lepchenko (8): After an excellent summer hard court season in 2015, Lepchenko has a significant wedge of ranking points to defend over the next two months including a last 16 showing at the US Open. The American player has had a stop-start season, missing nearly three months of the season between Doha and Rome (reported as an injury but rumours of a silent drugs ban are hard to dismiss). Lepchenko faces a tricky opener in Stanford against Alison Riske. Jelena Ostapenko v Catherine Bellis: A battle of the teens is the most intriguing match-up in an otherwise lacklustre slate of first round matches. Every tennis fan should have the opportunity to enjoy the Ostapenko experience… she’s fun to watch live! Bellis hasn’t done a great deal on the WTA tour since a fantastic first round win over Dominika Cibulkova at the 2014 US Open, but is still only 17! Ostapenko beat Bellis in their only previous match (6-3 6-2, US Open Qualies 2015) and i’d expect a similar result with Ostapenko’s superior weight of shot being too much for the American. Nicole Gibbs v Carol Zhao: This is a noteworthy match as both are Stanford alumni! 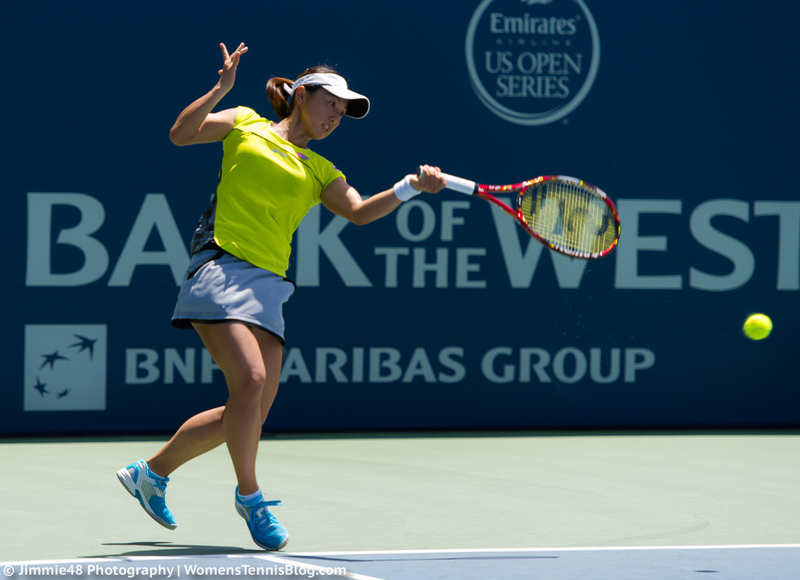 Zhao only turned professional very recently, while Gibbs has had a breakthrough year on the WTA tour in 2016. Gibbs though has lost seven of her last eight matches on the WTA tour (injuries did play a factor) but should feel more at home back on hard courts and particularly in Stanford. The pair are set to play doubles this week. Varvara Lepchenko v Alison Riske: If ever a match had three tight sets written all over it! Lepchenko’s the seed but it feels like a 50-50 match-up. The pair are tied at 2-2 in their head-to-head with Riske winning their last two matches in Tianjin (7-6 6-3, 2014) and Rome (6-4 6-3, 2015). V.Williams and Cibulkova are the obvious picks to reach the final but my hunch is that both could still be feeling the effects of Wimbledon. Venus has proved me wrong on many occasions so there’s that! I’m feeling good vibes for Vandeweghe despite the move from grass to hard courts. If Cibulkova were to fall early, the bottom half would be wide open. Konta’s proven herself to be very steady on the hard courts so she’s my champ for this week. Who do you think will win Stanford? Have your say in the tournament poll below and as always, comments are appreciated! July 17, 2016 in Stanford, Tournament Preview, WTA. I could definitely see Coco and Konta doing well here if they bring their best tennis. I also agree that Venus and Domi will likely face some burnout. Speaking of… Djokovic has announced he’s playing doubles in Toronto. What the hell is he thinking? He burned himself out here last year playing singles and doubles and this year he has Rio looming as well! so there is a chance that Domi might play a Radwanska again this year! wishing all the best to Urszula! Indeed, nice to see Urszula back, nasty injury she picked up earlier this year but is on the comeback, won a few matches at her last tournament in Stockton. konta steady?!!!!!! ROFL…. i guess this tour is vandeweghe’s for the taking. Whyyyy haha! I stand by that comment in reference to Konta on hard courts… 24-4 W-L on hard courts during the second half of 2015 and then in 2016, Aus Open SFs, Monterrey QFs, Indian Wells R16 and Miami QFs. AK Schmiedlova’s losing streak finally comes to an end! Thank god for that because it had become unbearable seeing her lose so much. some serious flopping today yikes. womens tennis has became a circus. and sharapova gone and no azarenka, its on life support. and women think they can draw crowds like the men lol. i can’t watch this trash anymore. There are lots of good players, who entered into this year’s tournament at Stanford. Venus, Cibulkova, Vandeweghe, and Konta all have big-hitting shots. But, it’s extremely tough to say who has the easiest or toughest path to the final. I would say either Cibulkova, Vandeweghe, or Konta will reach the final without dropping a set.